O, Canada, you are a shining star! We love our neighbors to the north! These are clever and entertaining! Some of them are quite good! What an interesting and varied collection. I think the only ones I’d seen before, and not necessarily in Toronto were “come in or we’ll both starve” – and, of course, that old standard, Drink Canada Dry. Nicely captured! Toronto – where I lived for several decades – now a Caper (Cape Breton Island, Nova Scotia). For cities, Toronto has it going on, but Cape Breton is oh-so-beautiful and one of my all-time favorite places. I’m a Bluenoser that got stuck in Toronto and can’t seem to get back home…..I’m the character from “Goin Down the Road” (1970) that never left !! Did you pick up The Clockmaker yet, Brett ? C’mon boy, git after that ! Hi, Mark, such things happen and going back is easier said than done. I looked up the movie you mention and that’s quite a classic and one I’ll have to watch. LOL on the book. I looked up The Clockmaker on your suggestion but am hoping to find a version other than the one sold by Amazon. It did prompt me to learn a little about Halliburton and his role in Nova Scotia civic life and I appreciated the local color. These are great Brett but I like the top one the best. hi, i created that sign…. could i get a link back? 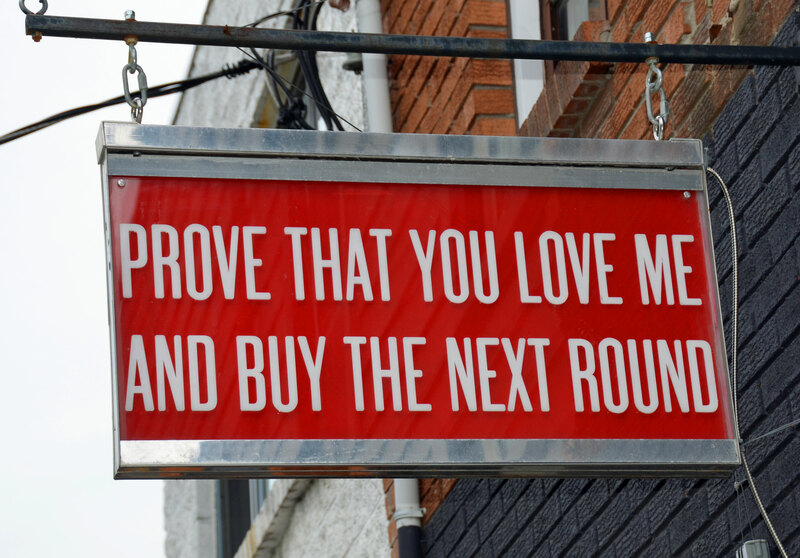 Hi, Ian, thanks for mentioning your connection to the sign (“Prove that you love me and buy the next round”). It’s eye catching and serves its purpose well. You do excellent work! For those interested, more of Ian’s creative sign designs can be seen on his site here: http://ianmilne.com/products/signage-design/ . These are great to see! What’s in “Sweaty Betty” I wonder. Yvonne, you’re witty! 🙂 Funny that you mention drinking, as Sweaty Betty’s is an unfancy neighborhood bar that is quite cozy and welcoming. I’ve been to a few of these places Brett, so nice to see the signs like this. June, that East End area is off the beaten path and quite interesting — good place for meandering. Gadabout is one of the best vintage stores I’ve come across. You have proven how wonderful Canada is, Brett. Gosh you are a better Canadian at heart for an American. I better pay attention. Humorous signs. Perpetua. ‘Come in or we both starve’ is nice. Yes, that one is clever! Honest Ed’s and Odds & Ends. Two of my favourite places to visit !! Those places have some character! I’m apt to capturing streets, buildings, nature, critters, people but enjoy other takes on memento or creative photographs. I greatly appreciate your visit to my own blog. I adore Nova Scotia! With air fare what it is going that way, it’s too long for me to visit again but that’s a province I think of fondly, second to my home. Family aside, visiting Toronto is always fun. Everytime I’ve been nearly anywhere, I learn of something else to see. Carolyn. Until I scrolled down the signs, never realised the ambiguity in Drink Canada dry! So funny! You’ve captured some fascinating signs, Brett — I love the “Mercedes Benz” ‘prove that you love me’ one the best! Little things like that can give a neighborhood some personality. That iconic Honest Ed’s won’t be with us much longer. After decades of being in business the store will be closing and a condo will probably replace it. Great gallery of signs. Gotta appreciate these icons while we can. Toronto is such a great place for signs! You captured it wonderfully! Yes — there are so many good ones! Really just scratched the surface. Good old Honest Ed’s. A real Toronto landmark! Ha, great selection! Love the featured image. That one is cute! Toronto, like so many other large cities, has so much to captivate one’s attention. I know I only scratched the surafce. Love local signage and local businesses. Tired of the same old, same old international companies clogging up the neighborhood.